Kenny Phillips is a well kent face in Scottish athletics – nowadays he is mainly seen with camera in hand taking his excellent photographs at athletics meetings all across the country in all weathers in every season of the year. The photographs are posted in picasa web and he encourages clubs and individuals to download them first of all for the individuals concerned and also for club purposes. The motivational power of photographs for athletes is considerable. There is however much more to Kenny than that. Kenny started out 70 years ago as a club runner for his local club, Beith Harriers and ran in no fewer than 50 consecutive national cross country championships – a quite remarkable record. He also ran in the prestigious Edinburgh to Glasgow relay race with the first run in 1954 when he turned out on the first stage. The ‘News of the World’ as it was often called because of the sponsorship was a hard race to run. The top 20 teams in the country, entry by invitation only and supported by eight buses, one for each stage, and a fleet of Rolls Royces for the officials and a slap-up meal in the Ca d’Oro in Glasgow for the prize giving. Kenny’s best run in the race was probably in 1958 when he ran the third leg: Ian Harris (an SAAA marathon champion), despite an accident on his new motor scooter just before the race, had run in to ninth, place on the first stage, Tommy Cochrane (another cross-country international runner) moved Beith Harriers up to seventh and then Kenny, with fifth fastest time of the day, took them up to sixth. Unfortunately the team could not maintain this high position but Kenny had had a terrific run. “Kenneth Phillips specialised in the mile but also ran the half-mile and cross country. He competed in the National cross country championships 50 times. His favourite course was at Stewarton where the field was similar to that at Beith, rough, sharp corners and 8 laps to the mile. He often won both the ½ mile and 1 mile at the Bonnet Guild Sports and, one year, was the first to break the 4 minute mile when he was the only competitor to realise that the lap counter had made a mistake with 3 laps to go instead of 4. On another occasion at Stewarton in the Medley Relay, Kilmarnock and Beith were neck and neck at the final changeover for the final ½ mile. Kenny was up against the Ayrshire Champion, Willie More, and dropped the baton when it was accidentally knocked out of his hand by Willie. Willie, being a perfect gentleman and sportsman marked time until Kenny caught up and passed him. Kenny then hugged the sharp corners and made Willie run wide each time he tried to pass. By the time they reached the final uphill stretch, Willie was exhausted and Kenny easily romped home for the winning team.” To those who don’t know, More was a first rate athlete with a 3 miles best of 14:21 – a good track man in all distance events, maybe particularly the steeplechase. The sport was different at that time, and many from that era feel strongly that it was a healthier sport too. The website has a record of a typical summer for Kenny. The area covered by meetings was wide – Glasgow, Clydebank, Ayrshire, Renfrew, Bute and all over the Central Belt – with transport often by public transport or pushbike. Kenny is a very quiet and modest man who doesn’t like to talk about himself but he did say that he thought one of his best his best races was when he won the 1500m at the World Youth Festival in Moscow in August, 1957. The picture below gives an idea of the size and splendour of the opening ceremony at the Lenin Stadium. This was Kenny’s first experience of a major games with a massive opening ceremony. 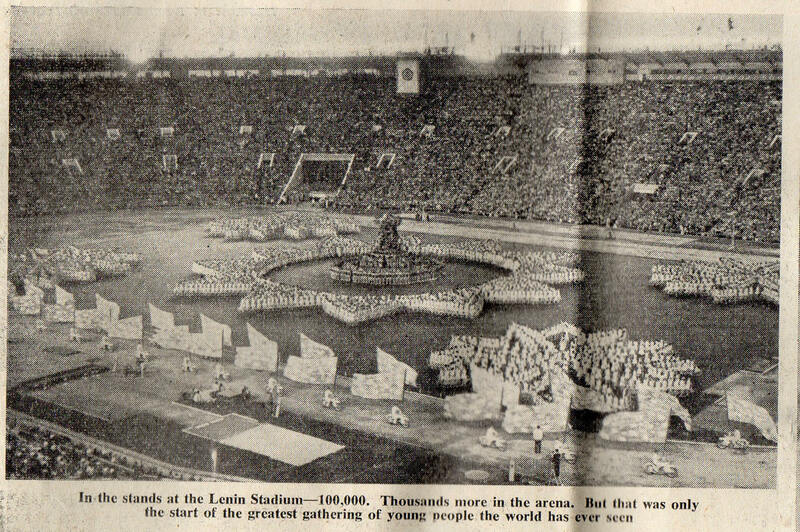 The World Student Games had begun in 1923 and continued under other titles until 1957 when they were under the banner of the World Festival of Youth and Students. The World Student Games continued as before but the Festival of Youth had been attached from 1947. Venues for the event, which was held every two years, in the 50’s up to ’57 were Bucharest, Warsaw and Moscow. By 1957 Russia had realised the publicity value of sport and made it a really big event, which was run in parallel to the World Student Games. The meeting was combined with cultural activities such as a visit to the Bolshoi Ballet. There was also time for seeing how the ordinary Russian families lived and there were some eye-opening experiences for Kenny and his team mates. He ran in the 1500m with the race run on a warm day at 2:00 pm. There were some cultural visits in the forenoon and the athletes had to compete thereafter. Kenny’s attitude was never to let others have an easy run, always make a race of it. This time was no different, he went for it – and won! It was a wonderful experience, he made many friends from other countries and he still writes to one of them to this very day. 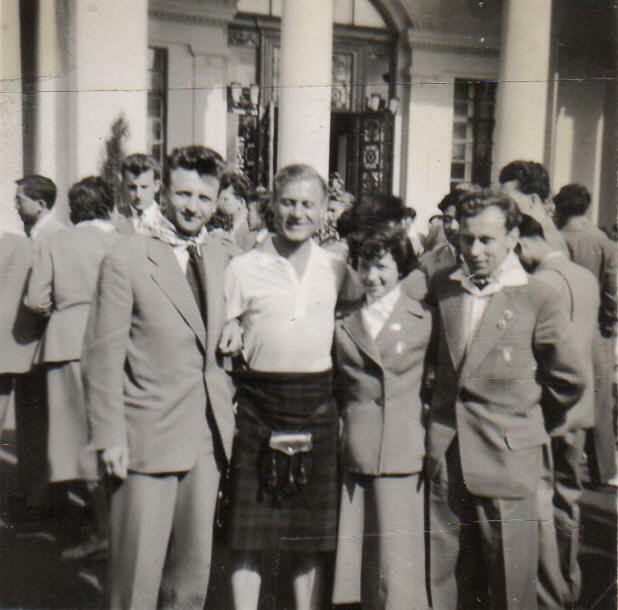 Kenny in his kilt with Judy Wolfe and two others of the English delegation. Kenny however bracketed that with his many double victories (Mile and half mile) at the Stewarton Bonnet Guild Festivals – when he usually returned with two clocks donated by the Provost whose son had a jewellers shop. Although he was mainly a miler, he often ran in the 880 yards simply because the mile was usually last on the programme and the half mile was fairly early so he ran in that as well. Initially he would ‘hare away in the first lap’ and be passed by several others in the second lap. 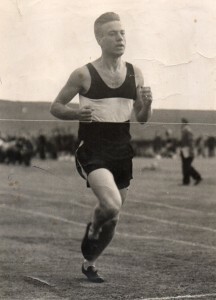 He changed his tactics when in one particular race at Babcock & Wilcox the Scottish mile champion Jimmy Reid was back marker and he was off 25 yards. He was passed early on by the other runners in the first lap but hung in behind Jimmy until the finish when he pipped him on the line. He changed his tactics after that. One of the big race meetings was the annual Rangers Sports at Ibrox where the field for the open handicap mile was a specially permitted 165 instead of 100 with three or four men on each handicap position. He remembers being off 65 yards with dozens of runners starting ahead of him and he had to make ground in each of the eight straights, hold it on the bends – and he eventually finished fourth, 50 yards behind the third man and out of the prizes. What training did they do? When he started it was a two and a half miles run on a Tuesday and again on the Thursday with a race or two on the Saturday. Then when they saw how good George Lightbody was they began to follow his training methods. George was a very good athlete and raced successfully at distances between 100 yards and 10 miles although he was principally a half miler with a sub-two minute time. Everybody started to do that kind of training and the club at one point had half a dozen runners running two minutes for the half mile – that at a time when almost all tracks were grass or cinder of varying quality and shoe technology was not as advanced as today. The cross-country and distance runners were also later on influenced by reading of Zatopek’s training – as indeed were athletes all over the world – and the training load was increased. One of the local men who first took up the big mileage was Tom McNeish from Irvine who was even training on a Friday night before a Saturday race – and he was the Ayrshire and South-West champion. Over the country a source of pride is that he won the Over 50’s veterans cross-country championship at Troon and takes also great pride in his 50 consecutive national championships. I have looked at his running first because that’s what we all came into the sport for in the beginning. But he has been a one-club man and Beith Harriers was that club. When he was working in England he ran additionally for Rochdale AC and Horwich RMI but he has always been first claim for Beith (and Longbar) for his entire career. The willing always get the work to do and Kenny has been Secretary and Treasurer of Beith Harriers, Secretary and Treasurer of Ayrshire Harrier Clubs Association, and SAF Official. A tireless worker for the club and for the sport, he formed an offshoot at the Stewarton Sports Association (Athletics Section) and promoted the Stewarton Cross country Races for 30 years. When he moved to Stewarton, the Territorial Army was leaving and wanted to give their hall to the council but they did not want it. One of the councillors, Bob Craig, a cyclist, wanted a Stewarton Sports Association to be formed which would use the hall as their headquarters. The Association encompassed cyclists, footballers, and all sorts of sports and Kenny was responsible for athletics. He says that he had an empty hall and 50 youngsters with no equipment, not even a ball. He worked with them for years and many are still involved with the sport at some level, even if it is only running in some local 10K’s. There were several good athletes came from his club – one group , Matthew Porter and twins Gary & Keith Haro, with no experience at all finished first second and third in the under 13s mile at the Beith Open Sports meeting, and then in the national cross-country at Irvine Matthew came in second – he let a more experienced boy beat him at the finish when with more races under his belt he could have won. Another athlete in one of his groups was Rose Reilly. She could run and jump well but went on to become a real professional football star in Italy. Among her teams were Reims and AC Milan. Rose was quite a talent, just how good can be seen by looking her up on Google. A youths team, consisting of Tom Findlay, Robin Young, Tom McEwan and Freddie Slaughter, won both the Ayrshire and West Cross Country Championships. The Stewarton Sports Association was also in action on a Sunday morning from the Strandhead Pavilion with many local, and some not so local, coming to jog and run over the local Ayrshire countryside. 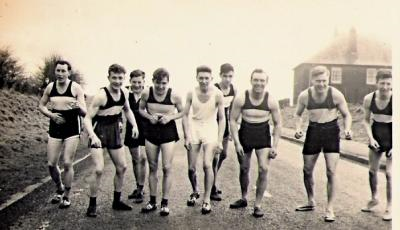 All levels of athlete came along – many will remember the talented Jim Ash, Ultra Runner Peter Dawes, Ironman Alex MacPhee, Jim Auchie, with his 2 sons and daughter, who started the Dalry Thistle Club, Chris James, the British Orienteering champion came down when he was working in the area and many more. A favourite course was both banks of the River Annick with a wash and swim near the finish, summer and winter, and often having to break the ice. Kenny got married at the age of 30 and moved to Lancashire. He stopped training, put on some weight but continued to enjoy cross country running on a Saturday with Horwich Mechanics and Rochdale Harriers. 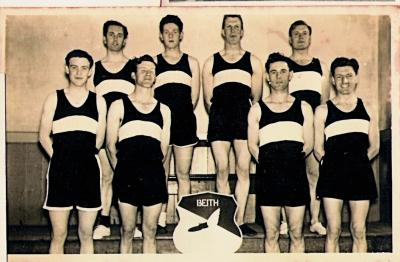 Horwich Mechanics was similar to Beith Harriers, having started in 1924 and struggling to field a team but now has a membership of 250. The chairman had participated in the 1930 Kinder Scout Mass Trespass to open up the countryside. Rochdale Harriers was a much larger club and hired the Town Hall every Christmas to hold a Dance and raise enough money to finance the club for a whole year. Kenny’s eyes were opened when he saw the mass participation in the cross country events for boys and girls due to the co-operation with the schools. This was in 1962 and he tried to bring some of that to Scotland when he returned. One of the the events he started up was the Stewarton cross-country race. They were run for 30 years – pretty well until all the original organisers had left – and attracted most of the best of Scottish talent including Liz Lynch and Lachie Stewart. In one year they had 800 competitors. They had help from the County Youth Services whose head Walter Howie would send someone to help with entries and results, lend them a Gestetner machine to print out the results, hire of the hall only cost them £1. But there were also problems – they had to get permission from a separate letting committee which included ministers of religion from all local denominations who were reluctant to give them that permission to use the school and hold the race on a Sunday. That meant an appeal to the whole county council where they got their decision. Then there was the problem of sweeping out the accommodation after the race, scrubbing the floor, etc and then have to pay £75 for professionals to do it because, no matter how well they had done it, that was what the system required. That is all in addition to organising the race with advertising, entry forms, prizes, result organisation and in addition Kenny and his colleagues had to lay the trail and their wives made the teas and baked the cakes. It was a lot of real work and to carry it on for 30 years with no complaints was a wonderful job on the part of all involved. He was of course also active outside Ayrshire and was one of the men who, along with the late Alex Johnston helped lift the Glasgow Women’s 10K to the big 10K – OK event that it became. Over 1.000 3 feet high, high-tensile steel trail markers with coloured plastic were hand made but one spring at Pollok Park some of the students got lost where the yellow flags passed through a “host of golden daffodils”. But it is as an Ayrshire enthusiast that will be best known. Kenny with the aid of the BBC Children in Need grant for 3 years also promoted the Garnock Valley Athletics Project with branches in Beith, Glengarnock, Kilbirnie and Dalry schools. The Harriers provided 4 coaches, Trish Sloss, Stewart Ferguson, Lindsay McMahon, Robert Connelly, and the schools co-operated with 4 teachers. A SAL senior coach was engaged to train the coaches. Kenny on the right in the back row.